Now your children can swim with Ariel from The Little Mermaid or rock with Hannah Montana, right in the comfort of their own home. All they need is Disney’s new In Scene Video Camera. In the box you'll find the pocketcam, Disney Flix video editing software, a tripod and a blue screen (otherwise known as a large sheet of blue fabric). 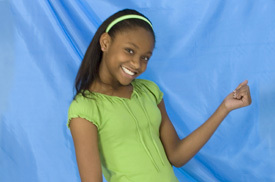 Tack the blue screen up, shoot your scenes with the blue screen as the backdrop and then use the software to put yourself in your favorite Disney films. 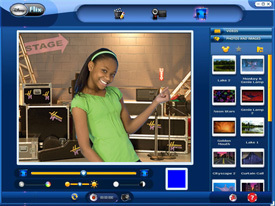 The software also lets you add music, character overlays and sound and visual effects. When you're done, you can share your movies online or via email. 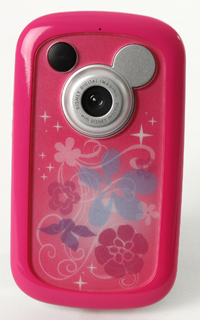 The "Princess Petals Pink" pocketcam features one-touch recording for up to 30 minutes, a 2-inch LCD viewscreen and a built-in rechargeable lithium-ion battery.